Central question: What does resistance look like? 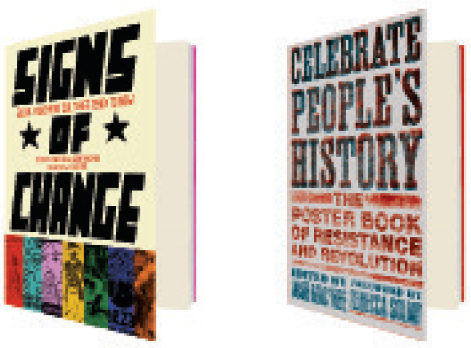 If you happen to be either a teacher in a progressive school or a politically minded college student, you may have spotted the posters in Celebrate People’s History: The Poster Book of Resistance and Revolution pasted to classroom or dorm-room walls. If not, now’s your chance to see the history of social justice interpreted by some of today’s most talented visual artists. To see rarely-glimpsed historical images and ephemera created by social justice activists across the world, look no further than Signs of Change: Social Movement Cultures 1960s to Now, Josh MacPhee and Dara Greenwald’s gorgeously designed catalog for the recent Exit Art exhibit of the same name. Taken together, these two books represent a departure from history as most of us learn it, both in form and content: Celebrate People’s History is a radical retelling of history by contemporary artists; Signs of Change is a visual record of historical events themselves. Each full-page image in Celebrate People’s History comes from the full-size series curated by Josh MacPhee and celebrates “successful moments in the history of social justice struggles,” many of which fall outside the familiar canon. But these images aren’t what you’d expect—they’re not the old clenched fist pumping the air. “Rooted in [the] do-it-yourself tradition of mass-produced and distributed political propaganda,” the posters are stylistically diverse, each designed by an artist, including the likes of Jeff Stark, Swoon, Cristy C. Road, and Carrie Moyer. In the May Day poster designed by Eric Drooker, a celebratory army of figures with glowing red hearts and instruments clutched ecstatically in their hands rushes toward the viewer against a fish-eye backdrop of skyscrapers. The poster commemorates “the May 1st, 1886 nationwide protest for the eight-hour day and the following ‘Haymarket Affair,’ a pivotal event in the history of workers’ and anarchist movements in which four labor organizers were hanged by the State in Chicago.” Never celebrated May Day? Maybe that’s because it’s “a time of celebration and opposition throughout the world, except in the United States where it began.” These images are as much educational tools as they are aesthetic delights. The posters offer graphic representations of everything from the Diggers to the Haitian Revolution, Eugene V. Debs to Wangari Maathai, Las Mujeres Libres to the Korean Peasants League. Many of these subjects have been overlooked, or actively erased, by mainstream history books. Take the National Prisoners Reform Association: “In 1973 a group of workers in Walpole, Massachusetts, forged a cross race coalition demanding better pay, improved safety, and a bigger say in determining their working conditions…. That the workers were prisoners and that in taking control of the factory they also took control of the prison makes the story even more amazing. During their period of control, Walpole went from one of the most dangerous prisons in the US to one of the safest. Education classes were developed and the idea of rehabilitation actually became a possibility.” There is something thrilling in the discovery of the NPRA, the Brotherhood of Sleeping Car Porters, or the more recent Cochabamba Water Struggle, a Bolivian uprising that readers of American news may have missed. The second book in this pair, Signs of Change, showcases art produced by social-justice activists from the 1960s to the present day. It represents the culmination of the two years MacPhee and Greenwald spent searching for art and ephemera produced by participants in social movements across the globe, from Indonesia to Northern Ireland to Portugal to San Francisco’s Alcatraz Island. The result of their dogged research is a stunning collection of over one-thousand posters, flyers, and photographs, many of which have never been displayed before: a visual history of what people have wanted and how they’ve gone about trying to get it. Signs is busier than the poster book, with multiple images on each of its oversize pages organized into sections with headings such as “Autonomia [1960s–1980s, Italy],” “The Democracy Wall [1978–1979, China],” and “Anti-Nuclear Movement [1960s–present, International].” It showcases about four hundred of the items displayed in the exhibit, including rarely seen graphics from the 1978 Iranian Revolution—a howling worker in blue coveralls with decapitated arms; the creepy green hand of a B-movie monster, whose cuff bears the flags of Britain, the U.S., and Russia, being stabbed with a knife; photographs of Iranian demonstrators with cans of white paint, slapping slogans on city streets—that remind the reader that a political left exists in Iran and that the revolution wasn’t all about religion. There is also a series of block prints, cut from rubber desk mats taken from occupied buildings, that depict the 1980 student uprising in Gwanju, South Korea, during which students were beaten, raped, and bayoneted. This event has been so fully repressed, all images associated with it so fully purged, that these block prints represent a rare attempt to record the major events of the uprising. Through images such as these, Signs offers a precious glimpse of a past that has, in many cases, nearly been lost. We are reminded that history is, indeed, written by the victors. But these books do not only look back into the past. In a collection of contemporary EuroMayDay propaganda reprinted in Signs, you’ll find stark, Ikea-looking images of single-color figures against a white backdrop that represent workers in the recently dubbed precariat. If you are a writer, an artist, or a freelancer of any sort, you fall into this category, which is defined by economic precarity, “a concept commonly used in Europe… to describe the lack of security or predictability in contemporary labor conditions… a life where workers have no social safety net… loss of job security and lack of benefits… including ‘flexible’ workers in creative industries, temporary workers, day laborers, immigrants working ‘illegally,’ and service sector employees.” This is the new look of protest against social injustice: clean, slick, sophisticated. This is history in the making. Both of these books offer images of where we have been, not only in an attempt to record an alternative history, but also to encourage readers to imagine how we might forge our future.